My first attempts with sauerkraut started several years ago when we started getting our fall CSA baskets from Sue & Gary Gauger at Natural Farm Stand in Richmond, IL. Our fall CSA baskets are always stuffed full to overflowing with beautiful squashes, onions, carrots, and of course – cabbages. Cabbages of every variety – red, green, Napa, Bok Choy, and Savoy. The first year of the CSA, after I tired of coleslaws, stuffed cabbage and cabbage wrapped tacos, I ended up gifting the extra cabbages to any friend who would take a cabbage. While it’s great to share the extra with friends, I really wanted to use the cabbages myself. So, the second year that we got the CSA, I was prepared for the cabbages and had researched making sauerkraut. I have a German heritage and have memories of sauerkraut on my grandparent’s table, but I had never actually seen or participated in the process of making kraut. And sadly, my grandparents weren’t around any longer to teach me the tricks of kraut. All I knew was that kraut from the grocery store doesn’t taste anything like the real stuff -not even the packages in the refrigerated section. So, I did a little research on the internet and found some good cookbook references and I that next year I started a couple batches in half gallon Ball jars in my garage. Unfortunately, I was too scared to actually eat the first couple of batches of homemade kraut. The fermenting process was too different, and I honestly didn’t know whether I was doing things correctly. Over time, I’ve done more research and slowly gained confidence in home fermenting. The resulting kraut has been worth the learning experience. Maybe you have been to my kitchen to learn how to make sauerkraut and maybe this is your first time attempting to make sauerkraut with your extra CSA cabbages. I hope this post will help you get started with home ferments and inspire you to try some new things in your kitchen. Cabbage – any kind is fine. Fresher is better, because it will have more moisture in it if it’s been picked recently. It’s great if you can get it at the farmer’s market or stand. But cabbage from the grocery store is fine also. Once it is shredded and packed, the cabbage really reduces in size, so don’t be afraid to pick out a really big head of cabbage or use several smaller ones. Salt – any sort of salt if fine as long as it has no additives – no anti-caking agents. 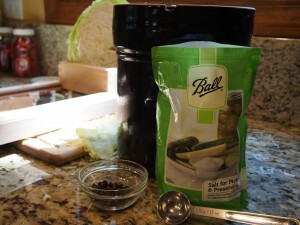 I use either Real Salt or Ball’s canning/pickling salt. A container to hold your kraut – to get started, you can use a half gallon or larger glass jar. A half gallon jar will hold about a 3 pound head of cabbage. If you can find a small food grade bucket, they work great also. There is no need to invest in a crock or special equipment. Optional ingredients – you can add spices or veggies to your kraut. Some popular spices include caraway, juniper berries, bay leaves, or hot pepper flakes. Veggies can include carrots, onions, hot peppers, or even apples for a sweeter kraut. 1. The first step in making kraut is to clean the cabbage. Usually removing the outer layers of leaves is enough to clean it. Wash it also, if necessary. Next cut the cabbage in half down the core and cut out the core of the cabbage. 2. The next step is to shred the cabbage. You can slice it with a knife into thin strips (about the thickness of a quarter). This method works well if-especially, if you are only doing a couple of heads of cabbage. I usually do a big batch of kraut when I make it, so I use a kraut board to slice my cabbage. The kraut board allows you to slice the cabbage quickly into very thin, even slices. If you decide to use a kraut board, be sure to wear knife gloves to protect your fingers from the sharp blades – honestly, this isn’t a bad idea even when you are using a knife. 3. After you have one head of cabbage shredded, put it into a big bowl or directly into your fermentation vessel, if it is a larger vessel. Add one tablespoon of salt for each small head of cabbage, or 3 T of salt per 5 pounds of cabbage. Also add any extra spices that you are using. I usually add about 1 teaspoon of caraway seeds or juniper seeds per small head of cabbage or 1T per 5 pounds of cabbage. Mix in the salt and spices using your hands and massage the cabbage a little. Now let the cabbage rest for 10-15 minutes. If you are doing more heads of cabbage, the resting time basically happens while you shred the next head. Now pack the cabbage into your vessel. If your cabbage is very fresh, you will probably already notice water starting to be pulled out of the cabbage and pooling in the bottom of your bowl. When you pack the cabbage, push it down hard to make sure it is really packed in. You can use a special kraut pounder, but I usually use a potato masher or my fist. You want to submerge the cabbage under the brine. 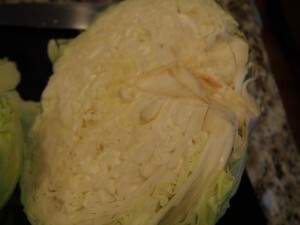 If you don’t have enough brine to submerge the cabbage, check it again the next day. If you still don’t have enough brine, then you should add brine to cover the cabbage. You can make your own brine by dissolving 1 1/2 tablespoon of salt into four cups of water. 4. Now weight down your cabbage to help keep it under the brine. When I’m using a glass jar, I fill a plastic bag with brine and use that to keep the cabbage submerged. When I’m using a plastic bucket, I put a small plate over the top of the cabbage and weight it down with a clean rock or another jar filled with brine. Cover the container with a towel or other cloth. 6. If you’d like to make wine kraut – add 1/2 cup of dry white wine per 5 pounds cabbage to your container on the second day. 5. After 24 hours, remember to check to make sure that the cabbage is covered with brine. If not, add brine to cover the cabbage (see step 3). Check the sauerkraut every couple of days to see if scum is forming on the top of sauerkraut. If you find scum, scrap it off daily and wash the plate and weights. If you want to avoid scum on your kraut, you can use an airlock on your jar. Airlocks are used in beer brewing and can be found at beer brewing supply stores. They really aren’t necessary for sauerkraut, but if the fear of a little scum or mold on your ferments is stopping you from trying home ferments, then it may be worth trying. 6. Store the sauerkraut container somewhere with a consistent temperature. 60 degrees is near perfect, but higher will work also. The time it takes to mature will depend on the fermenting temperature. Start tasting the kraut after about 2 weeks. If it ferments at 70-75 degrees, it will probably be ready at 2-3 weeks. 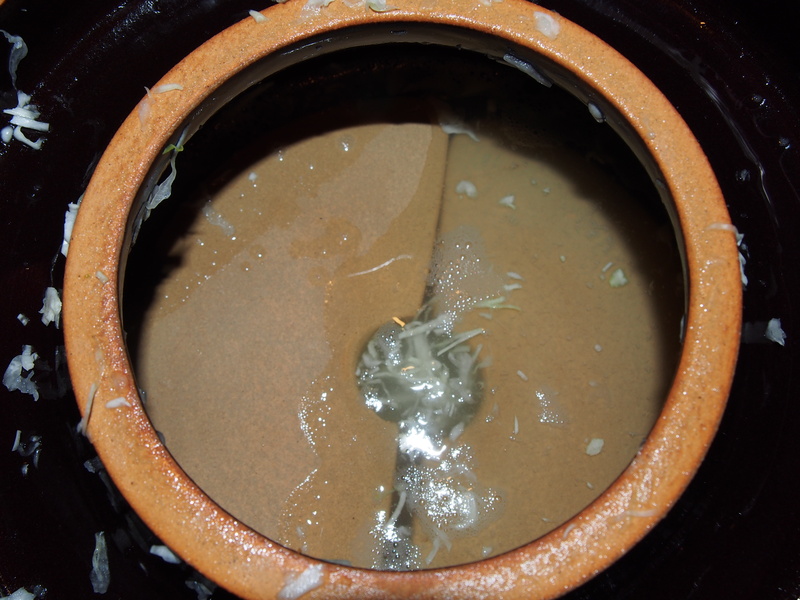 If it ferments at 60-65 degrees, it may take 5-6 weeks to be ready. The final product will be pale golden in color and have a tart, crisp flavor. You can also tell if it is ready by looking for gas bubbles being released from the sauerkraut – once the bubble stop, you know it is done fermenting. But you should really just go by taste, when it tastes good to you, then call it done. I usually end mine at about three weeks when it is fermented in my 68 degree basement. 7. When the sauerkraut is ready, you can store it, tightly covered in the fridge. I’ve kept it in my fridge for several months this way. You can also freeze it in plastic bags, which may preserve the Vitamin C better than canning, and it doesn’t hurt the texture too much. You can and should eat you kraut raw – it is perfect on sausages and pork chops. I also love it cooked with a pork roast or in a sausage soup. 8. If you want to can the sauerkraut, pack it and its juice into pint or quart jars. Leave 1/2 inch headspace and waterbath can for 20 minutes (pints) or 25 minutes (quarts). This storage method does not preserve the good probiotics of your kraut, but it saves on fridge space. Store the jars in a cool, dry, dark place. If you want to do more reading on fermentation, here are some of my favorite resources.